I love to paint snow paintings because the snow exaggerates design choices, for better or worse. It certainly forces one to concentrate on every shape and edge. There is much to learn from the Russian masters since they faced this challenge often. As I was painting the study for this, I was standing on the ice shelf that was breaking up, trying to see how close I could safely stand near the edge. 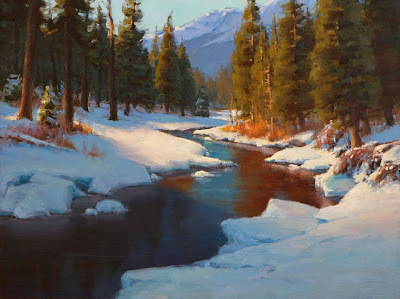 It was a beautiful morning and I loved every minute of being out in the snow painting. 24x18, Oil on Linen. SOLD at auction to benefit the Wallowa Memorial Hospital in Enterprise Oregon. This is stunning. At first glance I thought it was a photo.